Home / Blog / Is A Toilet Riser Any Good? Using the bathroom is another area that can also present a new set of challenges as our everyday mobility starts to change with age. One of the most common problems is the simple act of using the toilet, with some people finding getting on or off the loo becoming something that requires a bit more assistance. Here we look at a few options to help those that are finding this aspect of their life a little tricky. First, we’ll take a quick look at inexpensive solutions and then move onto a more comprehensive solution, a Mountway Solo Toilet Riser. But first of all, let’s deal with the question of what is a toilet riser? A toilet seat riser is a piece of assistive equipment to improve the accessibility of toilets for those with reduced mobility. It provides elevation and/or hand holds at the side for assistance, to make using the toilet more comfortable and help prevent the risk of falls. Many different types are available so it’s a good idea to review them thoroughly and think through how it will help or hinder your use of the toilet in practice. Be sure to take a look at the ones with a separate frame that can be fitted over the toilet pan, or consider wall mounted grab rails which can fold down to provide assistance and flip up out of the way when not required. These types of enhancements may make the toilet more usable, and for some people will be an adequate solution provided they have good strength to be able to lower and stand. However, where people find lowering and standing difficult, these solutions will be inadequate and may require the assistance of a carer. If this sounds similar to your situation, then a solution such as a Mountway Solo Toilet Riser may be a better option in helping you to return to independent use of the toilet. The Mountway Solo Toilet Riser is a battery operated, self contained unit that slides over the existing toilet pan. First you’ll need to check the measurements to ensure you have sufficient clearance around your toilet to fit this equipment. Having said that the Mountway Solo Toilet Riser is compatible with standard toilets and also has adjustable feet for use with high rise toilets. 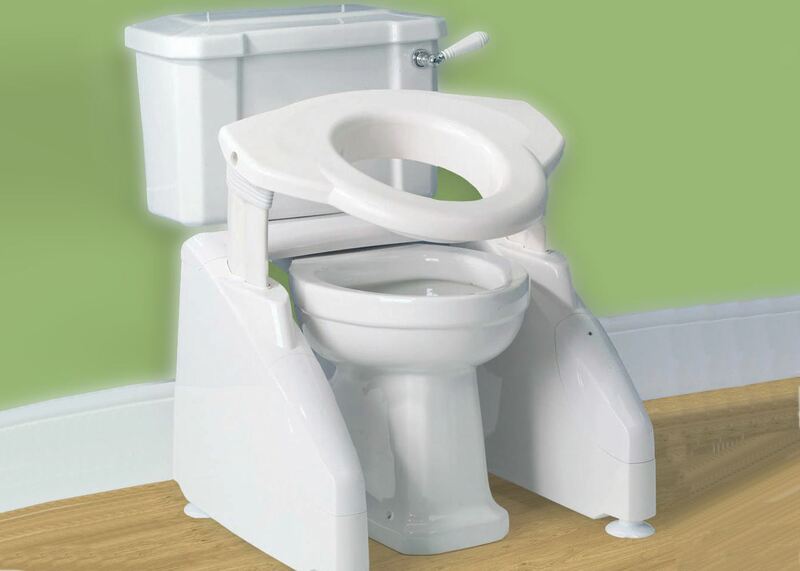 The big difference with this product is that it works like a rise recliner chair and lowers you onto the toilet and brings you back up to a comfortable height to be able to step away. So, if you already own a riser recliner chair and find it of use, it’s likely that you’ll also appreciate the assistance of a Mountway Solo Toilet Riser. Absolute Mobility specialise in designing accessible bathing solutions around the needs of people with reduced mobility. We can either include the Mountway Solo Toilet Riser when installing a new accessible bathroom. Or supply it to you on its own for easy assembly and installation in your existing bathroom. If you’d like to find out more about Absolute Mobility’s walk-in baths, easy access showers and wet rooms incorporating a Mountway Solo Toilet Riser, please feel free to browse our site or get in touch by calling 0800 29 22 110.